There are over 100,000 real estate agents in the United States who are millionaires….however just because there’s a lot of money in the real estate business, doesn’t mean everyone succeeds. As a matter of fact most real estate agents fail, and end up changing careers. 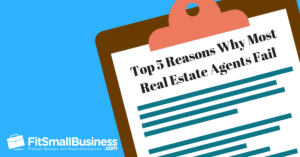 There are a lot of agents who think just because it’s easy to become a real estate agent, it’s also easy to make a lot of money as a realtor. That’s not the case. Yes you have the freedom to set your own hours, and work whenever is convenient to you. But, in order to become a successful realtor you have to HUSTLE. You can’t treat this like a hobby, you have to treat this like a career. One of the hardest parts of becoming a successful real estate agent is getting consistent leads. Most agents start off by relying on their contacts, like selling to friends and family. And although selling to referrals is a great way to earn commissions, those leads will dry up quickly. If you want to become a successful realtor you have to EXPAND, and look for leads elsewhere. Relying on your close friends and family will only last so long. Not all leads are created equal, and being being flooded with bad leads is worse than having no leads at all. Real Estate is a business that involves A LOT of face to face time. If you are spending a lot of time with unqualified leads, you will not have enough time to spend with leads that are actually going to close. If you want to find success as a realtor, you’re going to have to come up with a way to generate qualified leads. According to the National Association of Realtors, 82% of home buyers begin their search online. That means if you don’t have an online presence you’re invisible to 82% of buyers. Even if you’ve been in this business for years, your former clients and referrals are more than likely searching online. That makes the chances of them getting picked off by savvy internet marketers extremely high. If you want the fastest way to gain new clients, and avoid losing old ones, YOU HAVE TO BE ONLINE! Many real estate agents fail at online marketing because they try to do too many things at once. They spend money on advertising on facebook, pinterest, Zillow, instagram, have complex CRM software, etc. Instead of getting good at any one thing, they fail at them all. Unless you have a full-time team of marketers at your disposal, you have to get really good at one thing, BEFORE you move on to the others. At the end of the day the most important aspect of becoming a successful realtor is generating consistent qualified leads. However, like I said earlier, you don’t want to spread yourself too thin, and try to gather leads from 100 different sources. You want to start with one source, become an expert, and expand from there. My team of real estate experts have spoken to HUNDREDS of top realtors, and asked them for their best real estate lead generation ideas. We took the 10 best lead generation ideas from that research, and put them into a free guide, just for you. Enter your name and email address below, and get a free copy of your ‘Top 10 Real Estate Lead Generation Ideas’ guide, right now.